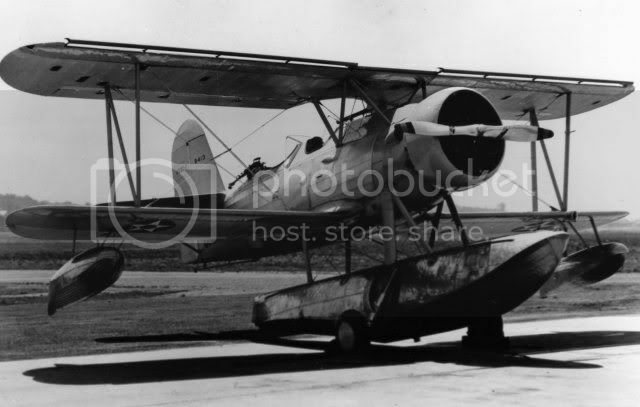 Here are some nice pictures of Curtiss SOC floatplanes operated from some unknown cruiser. Other pictures, not included in this post, suggest that the cruiser was transferring war materiel then (June 1941) as the B-26 fuselages are visible strapped to the deck, but I could not find the correct name of this ship. Thank you mattrix, there is enough detail in these pics to do a detailed 3 view for me to compose for my web site later on this year. Here is the prototype, 03C-1X. Note the leading edge slots, open cockpits & stainless steel amphibious float.